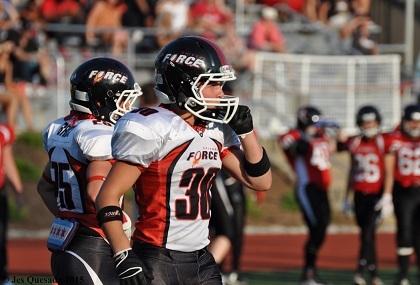 SOMERVILLE, MA It didn’t take long for the Force to assert themselves in their much-anticipated rematch with the Boston Renegades in the WFA conference semi-finals. 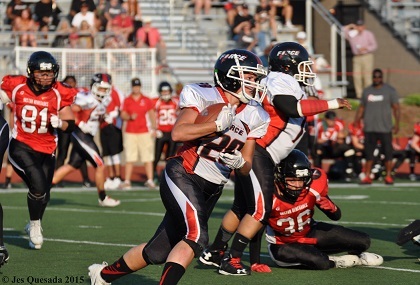 Jamie Fornal returned the opening kickoff 65 yards for a touchdown, stunning the Boston crowd into an uneasy silence. Kelly Rehr kicked the extra point for a 7-0 lead just 8 seconds into the game. The Chicago squad had arrived in town determined to avenge their only loss of the season to this same Boston team. After a Boston punt, Chicago began their second possession with discipline and purpose, methodically marching down the field. Quarterback Rachel Gore scored from the 1 yard line on a keeper. Rehr’s PAT attempt was blocked, Chicago ahead 13-0. Boston had a nice return on the ensuing kickoff and was able to string together a drive into the red zone but had to settle for a field goal to narrow the gap to 13-3. Chicago put together a 64 yard drive that culminated in another 1 yard TD carry by Gore. The 2 point attempt was unsuccessful, but Chicago led 19-3. Boston’s next drive was sustained by a Force penalty and the agility of Boston QB Alison Cahill, who scrambled 3 times for gains. Cahill completed the drive with an 8 yard TD pass to Adrienne Smith to cut the Force lead to 19-10. This would be the last time that Boston was truly in the game, as the Force began to establish their dominance. On the fourth play of the next drive Gore hit Cassey Brick with a screen pass and she jitterbugged 61 yards to the end zone. Brandy Hatcher punched in the 2 point conversion and Chicago went up 27-10. Boston’s next drive ended on a turnover on downs at the Force 24 yard line with less than 2 minutes remaining in the first half. On the second play Kelsey Casey was all alone at midfield and Gore hit her with a perfect pass for a 76 yard score. Carolyn Lee added the 2 point conversion for a commanding 35-10 halftime lead. Chicago’s opening possession of the second half was aided by a 31 yard catch by Fornal. From the red zone Gore collected her 3rd rushing TD and Rehr’s kick extended the lead to 42-10. Boston’s next possession ended on a turnover on downs and Gore scored her 4th rushing TD on a 15 yard scamper. Rehr’s kick was good and Chicago was enjoying – really enjoying – a 49-10 lead at the close of the 3rd quarter. Chicago’s stout defense forced another turnover on downs and their offense began from their own 19 yard line, moving steadily downfield. At the Boston 18 yard line Gore escaped again and used a massive block by Lee to reach the end zone. The touchdown was called back on a questionable penalty, taking points off the board and killing the drive. Boston picked up a meaningless touchdown as Chicago substituted freely in the remaining minutes. The final margin of victory was 49-18. 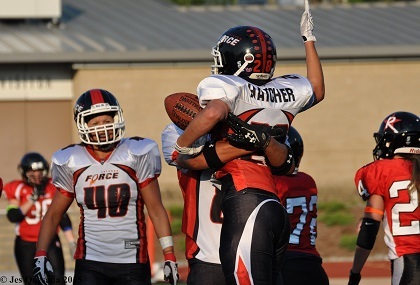 It was a total team victory as the Force had outstanding performances from many players on both sides of the ball. The offense scored on seven of their eight drives in a balanced attack that accumulated 502 total yards from scrimmage. Gore had a banner day throwing for 291 yards and 2 touchdowns while also rushing for 4 touchdowns. Chicago’s defense forced five changes of possession: 3 turn over on downs, a punt and a fumble. Angel Smith, Kelsey Casey, Jill Airaki, Melissa Nelson, Sonja Drangsholt, and Jamie Fornal led the charge. The win propels Chicago into the conference finals for the fourth year in a row. The Force will travel to face the undefeated and top-ranked DC Divas on July 25th. The winner of that game will represent the eastern conference in the National Championship in LA in August.